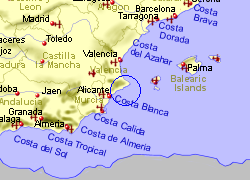 Anyone who has heard of Spain is likely to have heard of Benidorm - not necessarily for the right reasons - but that was many years ago. 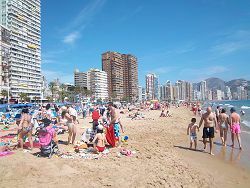 Yes Benidorm is a high rise holiday resort that can get very busy, but it has re-invented itself, and appeals to a lot of people, particularly those looking for some night-life. 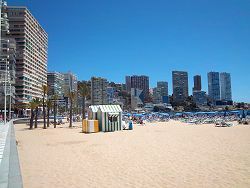 Benidorm is situated 45 Km north east of Alicante, on the Costa Blanca is blessed with two golden sandy beaches (the Playa de Poniente and the Playa de Levante - around 5Km total length), 30 discos and over 1000 restaurants. 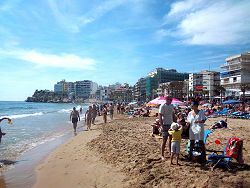 If you like the sunshine but prefer British food, you should be able to find that here together with cuisines from other countries. 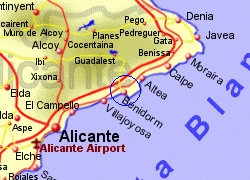 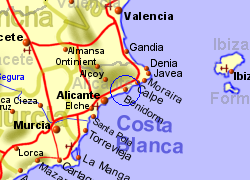 Map of the Benidorm area.